POCHETTINO: "IT'S A WORRY FOR US"
Tottenham manager Mauricio Pochettino says that Harry Kane could miss the rest of the season, after the striker suffered what looked to be a fairly serious injury to his ankle in last night's Champions League quarter-final first leg clash against Manchester City. The 25-year-old will have an MRI scan today to reveal the true extent of his injury, however things don't look good for the England international after he hobbled off following a nasty collision with Manchester City's makeshift left-back Fabian Delph during the second half of last night's tie. Kane left the brand new Tottenham Hotspur Stadium on crutches last night with a protective boot on his left ankle, and Spurs boss Pochettino admitted that he is worried about what this may mean for his prized possession. "We are going to miss him - maybe for the rest of the season. We hope it is not a big issue but there is not to much time to recover. He twisted his ankle so we will see how it reacts in a few hours," said Pochettino following the match. 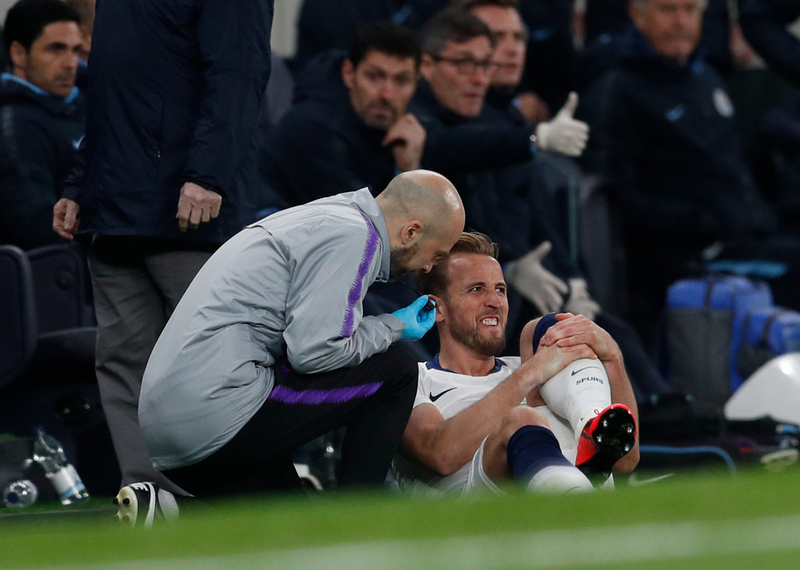 The most unnerving factor about Kane's injury is the fact that he's already spent time on the sidelines this season after damaging ligaments in the same ankle during Spurs' 1-0 defeat to Manchester United in January. The 25-year-old was out of action for almost two months after colliding with United defenders Victor Lindelof and Phil Jones at Wembley, while last season saw him miss a month's worth of action following an injury to his right ankle. "We need to check but it looks like it is the same ankle and similar injury," added Pochettino. "It is very sad and very disappointing." "It's the way he lands on his left foot. He makes the challenge and then his ankle rocks, which would suggest ligament damage," said former Celtic striker Chris Sutton, who was covering last night's game for BBC Radio 5 Live. 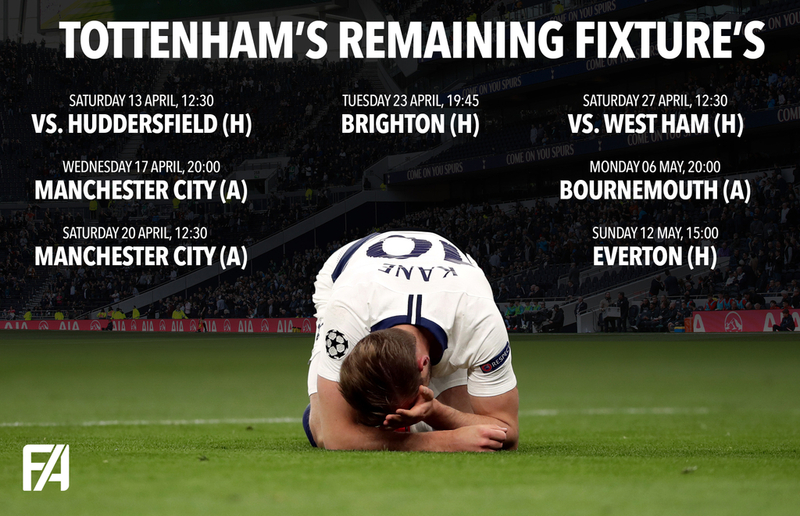 With the race to secure Champions League football next term now hotting up, Kane's absence will be a huge blow for Tottenham as they face a tricky run-in from now until the season's finale on May 12. The north Londoners currently sit fourth in the Premier League table, just a point above rivals Arsenal and three ahead of sixth-placed Manchester United but do face Manchester City in the league next Saturday, before hosting Chris Hughton's Brighton, who are currently fighting for their lives near the foot of the table. Spurs also face City in the second leg of their Champions League bout next week, then go up against West Ham, Bournemouth and Everton in the league before the campaign comes to an end in a month's time. Kane's chances of playing for England in June's UEFA Nations League finals has now also been thrown into doubt. Though the severity of the injury is yet to be confirmed, it has left a cloud of uncertainty dangling over the head of manager Gareth Southgate as he won't want to rush his star man back too quickly this summer. Despite losing their main man, Tottenham came out victorious at their gleaming new stadium last night, as player of the season Son Heung-min snatched a late winner for the hosts when he cut in from the left hand side and buried the ball home past city shot stopper Ederson just twelve minutes from time. Spurs will now travel to the Etihad knowing that just one away goal will probably put the game beyond reach for Guardiola's side, however without Kane to rely on up front, could quite easily be taken apart by a Sky Blues side who have been so dominant on home soil this time out. Down to the wire: Is this the tightest Premier League season ever?